Make a Difference in 2016! Because of you, families at risk of hunger will have the nourishing food they need for a healthy life all year long. With every $1 you donate, we can provide 4 meals for our neighbors in need. You will receive an email confirmation for each recurring donation. If you need to make any changes to your donation, please use our Gift Service Center. You may also email contribute@austinfoodbank.org or call us at 512 282-2111. 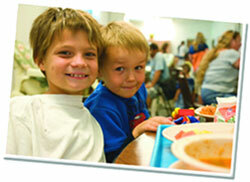 Check this box to receive e-mail updates from Capital Area Food Bank of Texas. You can unsubscribe at any time. Action Alerts: You may periodically receive email from us regarding the interests you select. "To nourish hungry people and lead the community in ending hunger."